Before Galveston 1900 Hurricane And Galveston TX. History. Before Galveston 1900 hurricane, Galveston was a fast growing city. It will be very interesting for Galveston tourists to know quite a bit about the history of this island before the hurricane. Galveston Island was originally inhabited by Karankawa and Akokisa Indians. A French explorer named LaSalle who visited the Island or nearby in 1686 named it St. Luis. However, troops of Bernardo de Galvez a Spanish governor of Louisiana occupied it temporarily in 1777 and renamed it Galvez-town. The first permanent European settlements on the island were constructed around 1816 by the pirate Louis-Michel Aury as a base of operations to support Mexico's rebellion against Spain. It was briefly occupied by another pirate called Jean Lafitte until he was forced out by United States Navy in 1821. 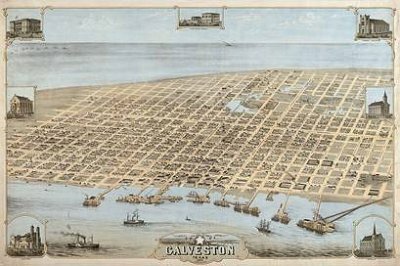 Here is an illustration of Bird's Eye View of the City of Galveston Texas in 1871. The city grew to become a lucrative business center. It became the main port of Texas, the Wall Street of the south and the capital of the Republic of Texas. As a major commercial center in the U.S, it attracted several tourists until the Galveston hurricane decimated the island. The impressive and tireless efforts by the people of Galveston has restored the commercial and the tourist status to a high level.